We’re always looking for fellow passengers who have been stranded by Wizzair either due to short notice (24-48) flight cancellation, technical problems or general malfeasance. If you have had such an experience and are interested in joining, please drop us a line with your name, email, and description of your circumstances. 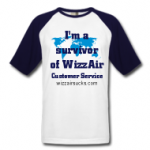 ***August 25th: Due to our on going WIPO arbitration with Wizzair, the link to the JOKE t-shirt site has been removed. 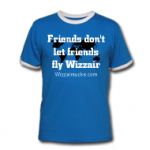 These are totally non-profit t-shirts but as we are not technically a non-profit organization, we would be providing financial benefit to spreadshirt.net. So I have removed the link for the time being. But please feel free to use the images below to make your own t-shirt!